They seemed like strangers when they bounded out of the truck in separate directions. Despite living together in the same house and same yard day after day, their enthusiasm in the field was at different frequencies. Winchester's single-purpose intensity broadcast from deep space while Hugo took in a whole range of signals. He lit on songbirds and flying insects. He ranged the mountainside in wild abandon. To watch them was like watching two different flight plans precluded from an intersection. The older and wiser Winchester and the new pup Hugo were each in their own world with a thin line of trust running back toward us. Winchester ran at full speed to the farthest range of the slope and just inside the curve of our view. He knew it was the furthest he could go before we would call him back. He worked his way through willow patches, weaving so that he covered them all in figure eights before floating in defiance of gravity and shale slides back down to us. Hugo ran one way and then another, straight up the mountainside and back down with rocks breaking behind him. The younger dog played loose while Winchester worked with intent. 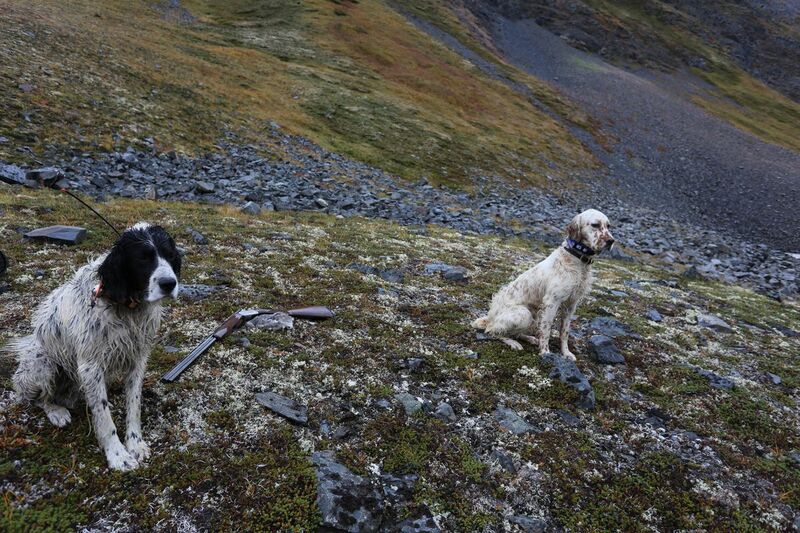 Hugo had pointed his first ptarmigan earlier in the fall. He had also seen a spruce grouse fall to Steve's gun in the woods. Those two experiences weren't enough to impress on him exactly what it was we were doing. The whole of a hunt did not occur to him as much as its parts were all equal wonders in a vast array of possibility. They were in two different worlds when Winchester went on point at the top of the hill. We could see just his tail over the rise. The birds were 100 yards away when Steve put Hugo on a check cord. The little dog bucked and pulled as we moved closer. They were a young group of whitetail ptarmigan more likely to run than fly. I walked past Winchester to flush the nearest bird. The bird did not move even as the rest of the covey wavered at the periphery. I looked back to Winchester. He stood solid in a petrifying stare. In the distance Hugo strained to break the tension against a tight rope. I walked closer to the bird and the rest of the covey flushed. The single bird held. It seemed incapable of moving no matter how close I got. I looked back to Hugo again, and the bird ran. Winchester hadn't moved, and neither had Steve. Only Hugo and I were frantic. I followed the bird. It flew a short distance — not far enough for a shot. The sounds and smells of the morning were all gone, and all I had was a jam of thoughts slowing my action. Just then, without seeing the rock-colored bird lift off the ground, its white wings opened in the gap of the rocks above me, and I shot. Hugo, let loose, ran toward the fallen bird and passed it. He was wild with the scent in the air and ran all around the bird. His senses were hot, and my voice was lost in static. "It's right there, Hugo," I said. His tail wagged in circles as he ran one way and then another, up the rocky slope past the bird and back down. I remembered the first time I had seen a ptarmigan. The bird stood still in the rocks on the bank of a mountain stream. I'd looked at the exact place many times and didn't see it. It's hard to see something you've never seen. But that moment, when your focus adjusts and you attune, the image strikes you. Hugo grabbed the bird with the fierceness of that discovery. Winchester let him in a rare act of grace. Their worlds had finally come together in an unlikely harmony. It reminded me of something the great jazz guitarist Wes Montgomery had said about practice, "I never practice my guitar… from time to time I just open the case and throw in a piece of raw meat." There are plenty of interpretations on what he could have meant, but I like to think he meant that his guitar was a living thing. Likewise, the hunt is a living thing that we do not play as much as feed. That first hunt with the two of them was two years ago, and this year the pair hunted the last day of the upland bird season in Southcentral — March 31 — with us. No matter the fact that they were related as father and son or, more appropriately sire and pup, they still acted like strangers in the field. I had heard that one dog will train another and have read delightful stories of old females chastising their pups for not honoring points or flushing birds. Winchester took no such care to raise Hugo up as a bird dog. They were each hunting on their own again, and my head swung from left to right as they cast clear of each other, and I strained to watch them both work. Winchester went on point and Hugo, improved from the previous years, backed his point. Then he took a few steps forward. The 8-year-old Winchester held his point and watched as Hugo stepped closer and closer to the bird. I was 200 yards away and could see I wouldn't have a shot. I knew Hugo was going to flush the birds. "Whoa," Steve called. If Winchester could speak, he might say, in a laconic voice, "The kid is going to wreck it again." And Hugo might say, "I. Just. Can't. Help. It." I watched as he charged the bird, which flew and gave rise to a flight of four still-white willow ptarmigan. The birds coasted down the snowfield to the valley below. The white-on-white of their wings a play of sunlight on snow. Hugo was delighted and Winchester, aloof. We didn't shoot any birds that day, and that was alright. There is something to be said for success measured by the failures leading up to it. Every day afield was a chance at that moment when the two of them finally harmonized with each other and with us. Until then, they ran to the songs in their hearts — young and old. They found birds, and let them go. Christine Cunningham of Kenai is a lifelong Alaskan and avid hunter. 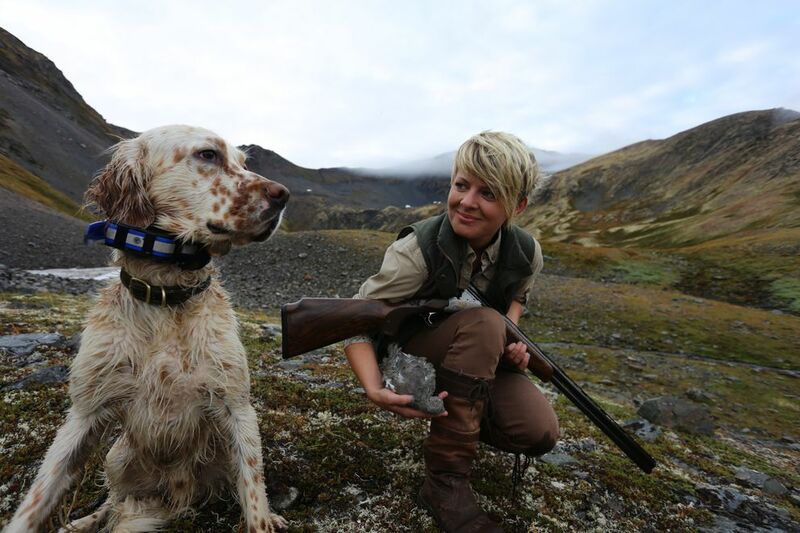 On alternate weeks, she writes about Alaska hunting and fishing. Contact her at cunningham@yogaforduckhunters.com.